Dive Three: Exciting Finds on Our First Coral Dive! After a windy and cloudy morning, Alvin surfaced this afternoon to calm seas and a bright sky. Image courtesy of DEEP SEARCH 2018 - BOEM, USGS, NOAA. Download larger version (jpg, 4.5 MB). Many members of the DEEP SEARCH team will spend the coming months and years fully characterizing the significance of our August 23 dive, which revealed extensive, previously unconfirmed Lophelia reefs. Experience the entire eight-hour dive on an extensive coral environment in just over three minutes with this time-lapse video. Video courtesy of Dan Fornari, Woods Hole Oceanographic Institution. Download larger version (mp4, 236.7 MB). When Cathy, Erik, and pilot Bruce Strickrott surfaced nearly eight hours later, they had a sampling basket loaded with different coral species, including Lophelia, Enallopsammia, Madrepora, and octocorals (plexaurids, primnoids, Anthomastus). Lophelia was by far the most sampled coral on today’s dive, and for good reason—it is the dominant reef-forming coral in the deep sea, and many members of our team are interested in better understanding its presence here in the U.S. south Atlantic. Amazingly, Cathy and Erik observed continuous live reef or coral rubble of Lophelia for the entire dive. 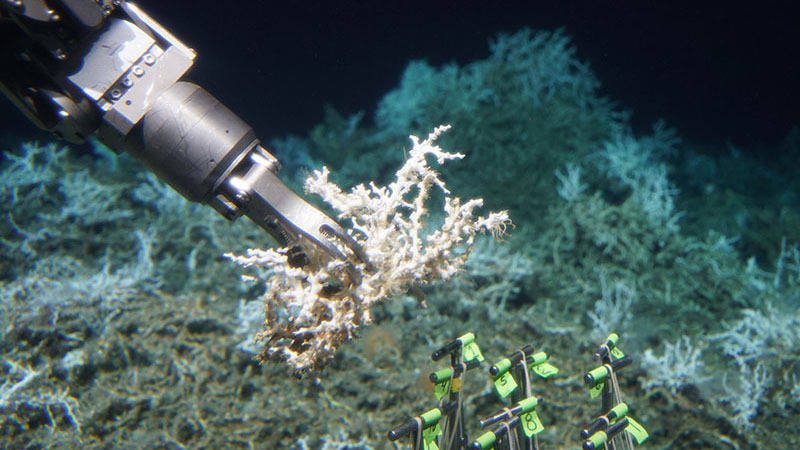 Their visual observations correspond with mound features recently mapped by the Okeanos Explorer, providing further evidence that many of the mapped mound features are actually formed by corals. As Lophelia grows and dies over time, new Lophelia grows atop the old skeletons, forming continuous reef structures that could stretch much farther than we ever imagined on the U.S. east coast. When the lengths of all of the mound features and probable reefs in the region are combined, the DEEP SEARCH team estimates that there’s approximately 85 linear miles of Lophelia reef here! Alvin collects a sample of Lophelia pertusa from an extensive mound of both dead and live coral. Image copyright Woods Hole Oceanographic Institution. Download larger version (jpg, 5 MB). Once the samples collected during the dive were on deck, all the members of the coral team immediately jumped into action to process the newly collected samples, just as the mud team had done for our second dive. Ten quivers and six biobox inserts were moved as quickly as possible to the cold room. 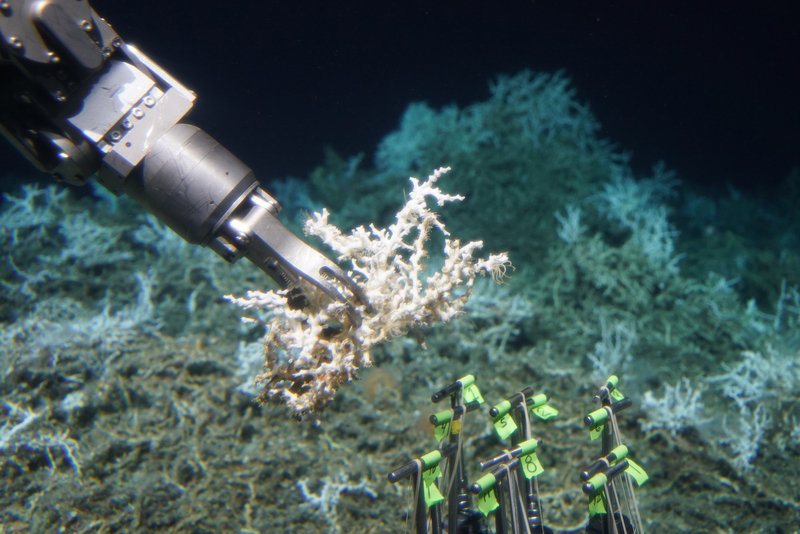 The temperature on the seafloor is much colder than that at the surface, and the corals can easily be heat shocked. The seafloor water temperature hovered around 48°F at this dive site, while the surface water temperature neared 86°F. With at least two DEEP SEARCH scientists hoping to conduct experiments with living corals, time is of the essence! 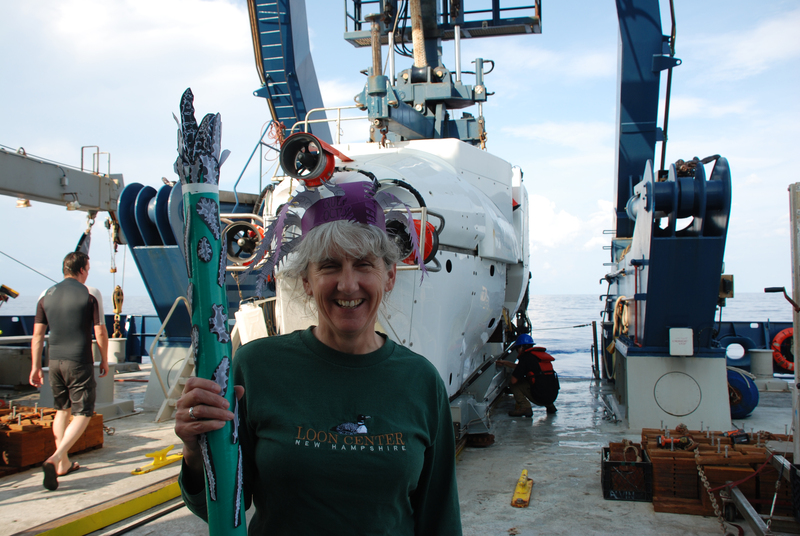 As it was Cathy McFadden’s first dive, she was crowned Queen of the Octocorals when she arrived back on deck—and then got the customary dunking in water after that! Image courtesy of DEEP SEARCH 2018 - BOEM, USGS, NOAA. Download larger version (jpg, 4.2 MB). 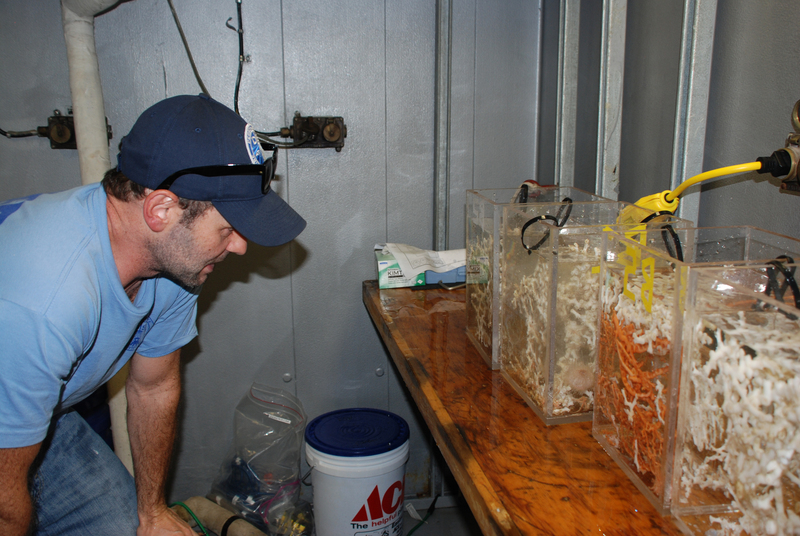 Erik Cordes inspects the biobox inserts filled with corals after today’s dive. The white corals are Lophelia pertusa and the orange are Madrepora oculata. Image courtesy of DEEP SEARCH 2018 - BOEM, USGS, NOAA. Download larger version (jpg, 4.9 MB). With all of the samples safely in the cold room, the pace calmed down—at least a tiny bit. One by one, each box or quiver of corals and associates was brought into the adjoining biology lab for a multi-step intake process: each species in the container was assigned an individual sample ID number, each organism was photographed for records, and then each scientist had the opportunity to take a sample from the organism. With six scientists all in the same 20 by 20 foot room, things can get a bit chaotic, and a number of folks were up late into the night sorting through all that had come aboard. Ideally, we’ll have many more successful days of sampling to perfect the rhythms of the coral lab sample processing. 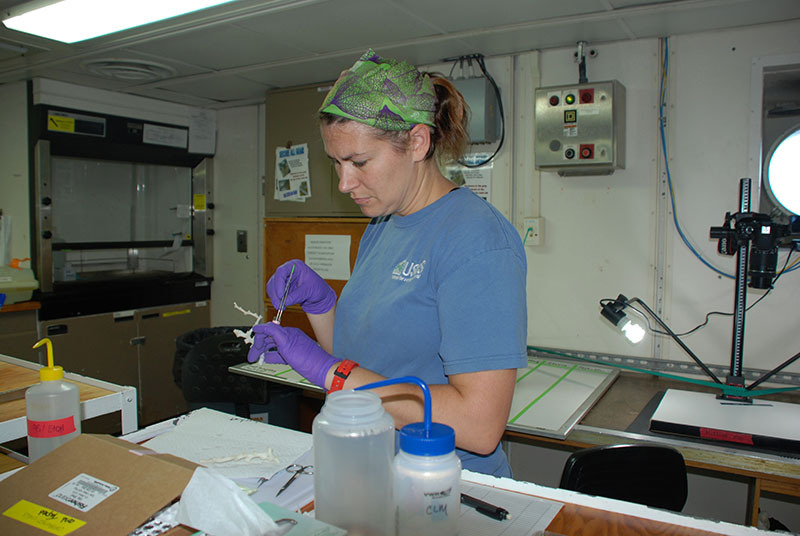 Demopoulos lab manager Jennie McClain-Counts samples a piece of Lophelia for future chemical analysis in order to help characterize deep-sea coral food webs. Image courtesy of DEEP SEARCH 2018 - BOEM, USGS, NOAA. Download larger version (jpg, 2.9 MB). 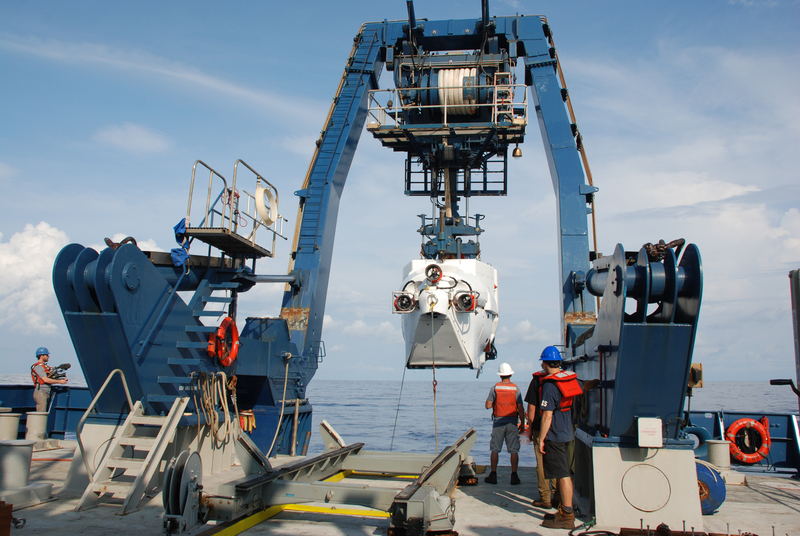 Overall, the work in terms of characterizing today’s Lophelia discovery is just getting started and will keep many members of the DEEP SEARCH team busy for months, and even years, to come.